I stared across the water at the multi-coloured buildings, searching the sky for a sign that the show was about to begin. I felt like a child on Bonfire Night, eagerly anticipating the first firework. 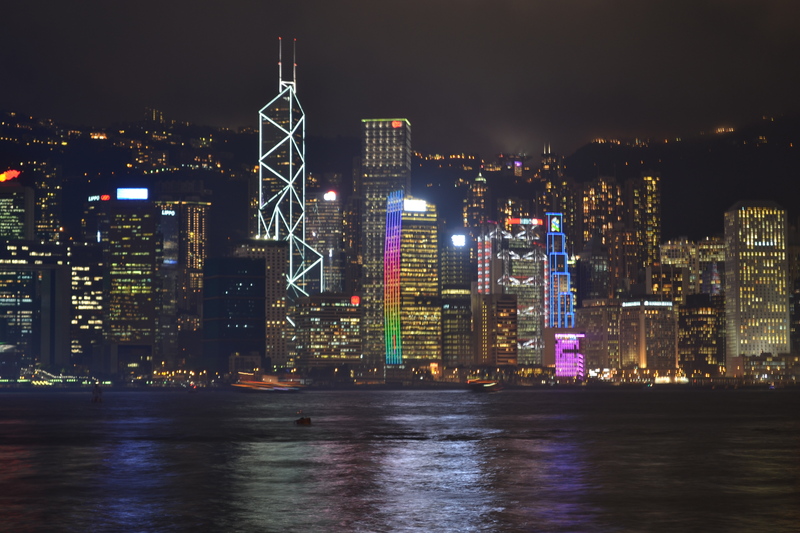 Only this was no firework display, but Hong Kong’s Symphony of Lights – a ten minute laser show spectacular which illuminates the magnificent skyline of Victoria Harbour. I sat in the special seating area along the Tsim Sha Tsui Promenade, where the raised platform provided the perfect viewing spot. For an hour, I waited and watched, as a crowd slowly formed around me. With the show due to start at eight o’clock, I knew that any minute now the first lasers would appear. As I glanced about, a distant, dark shape suddenly caught my attention. It was a tropical storm cloud. Seeming to materialise out of nowhere, it gathered pace and rolled across the sky toward us at surprising speed. Then, with almost comic timing, the heavens burst open just a few a seconds before eight. Oblivious of the weather, the automated music blared from the speakers as the symphony began. Amid the din of rumbling thunder and pounding rain, we all darted for cover. As we huddled beneath the shelter of the platform, lightning flashed across the sky. For a few minutes, I stood in awe of the storm’s impressive power. When the torrential rain showed no signs of abating, we made a mad dash for our respective hotels, using the surrounding buildings as partial shields. Ankle deep puddles swelled in the streets. Hurrying across the road, I lost my flip-flop in a pool of warm water, and quickly backtracked to fish it out before the traffic lights changed. There was something strangely enthralling about the storm; the foreignness of it compared to ones I was used to back home. I wished I could have seen the laser display and I’m sure it would have been incredible, but in all honesty I think I enjoyed my Symphony of Lightning much more.